This popcorn is a treat for you to snack on while giving out candy to trick or treaters, or while watching some scary movies, or at a Halloween party. I took my Salted Caramel Popcorn w/ Peanuts and turned it into a caramel corn with a touch of pumpkin puree and spices in the caramel for a extra festive treat. I packed up a container for my brother and threw a few white chocolate chips into it for a little something extra. Either way, it's a tasty Halloween or autumn snack. Caramel corn is best made a day ahead of eating so that the caramel is completely dried and crunchy and so that the salt, and in this case, the spices, will come through in the caramel. So make this popcorn today for any plans you have over the weekend! I don't know about you, but I still watch all the classic Halloween specials and I also love to watch scary movies (but my husband not so much with the scary movies). I always like to have a treat to munch on and maybe a fall beer or hard apple cider to go along with it. Happy Halloween!! Pop the popcorn kernels using an air popper into a large bowl. Set aside. Line two baking sheets with parchment paper and preheat the oven to 250 degrees. In a large saucepan over medium heat, whisk together the butter, brown sugar, and pumpkin. Bring to a boil. Turn the heat up to medium high and continue to whisk and boil for 4 minutes. Remove from heat and whisk in the spices, salt, vanilla, and baking powder. Be prepared for the caramel to bubble-up. Pour the caramel on to the popcorn and mix well to coat as evenly as you can. Then spread the popcorn onto the two baking sheets. Sprinkle with a little extra salt, if desired. Let cool and store in an airtight container. I'm a big caramel corn fan and this sounds perfect for fall! They look really tempting! Bet they are addictive. This recipe is a keeper! My little one loves everything with pumpkin. 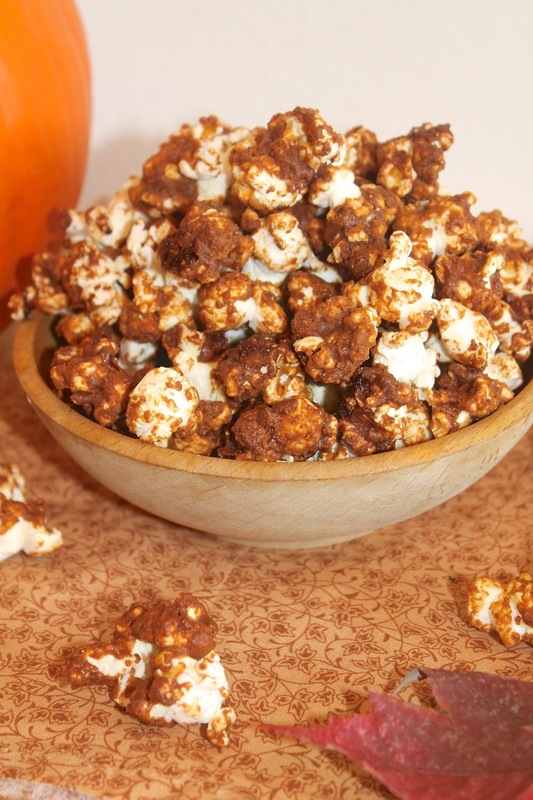 I will have to make this pumpkin spice caramel popcorn for her --and I as well! ;( Happy Halloween, Amy! I am a sucker for caramel corn---and your pumpkin spice version is perfect for the season!!! Your popcorn looks great - a fun fall flavour! Oh Man....I could eat that whole bowl!!! I love your popcorn recipes! My husband and I have been in a big popcorn-after-dinner-while-wathcing-t.v. phase, and this version would be so fun and fall-festive! 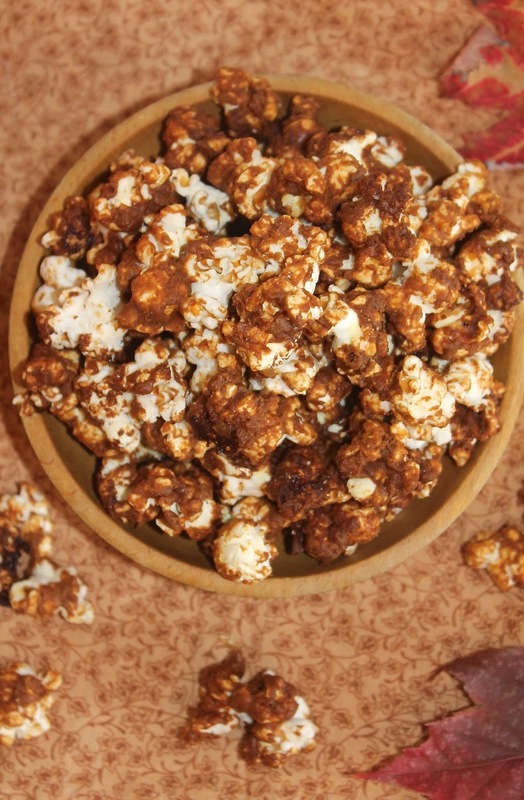 I love caramel popcorn and like the idea of spicing up with pumpkin spices...great idea Amy. I LOVE that there's real pumpkin in the mix and all those warm spices! How delicious! I hope you had a fun Halloween Amy! That's a brillant idea and not only for Halloween. Pumpkin and the spices add a wonderful exotic touch to the Popcorn. Can I have a a bit? This pumpkin spice caramel corn looks delicious! Love the flavour. This recipe is definitely my idea of the perfect treat! 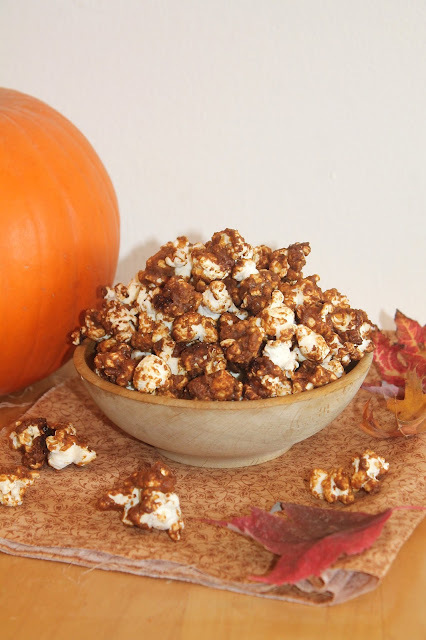 Amy, what a wonderful idea for making popcorn a special treat - I love pumpkin and spices and popcorn, so I am sure that I would love to munch away quite a bit of your Pumpkin Spice Caramel Popcorn! My daughter will love this. Can't wait to try this recipe. I'll be sharing on my page too. Thanks.